Good connection, easy to remove, no stray wires. I just replaced the main board on my Anet A8, not planning on doing that again. I found your mount for dual mosfet’s on Thingiverse, ordered a couple from Amazon.com so I could get them quickly and now they are installed. I will be ordering two more for the HyperCube I am building, don’t want to blow the new RAMPS 1.4 board I will be using with it. Thanks. What a perfect writeup and mount! Thanks for sharing all of this info, I just purchased an Anet A2 and can’t wait for it to show up! 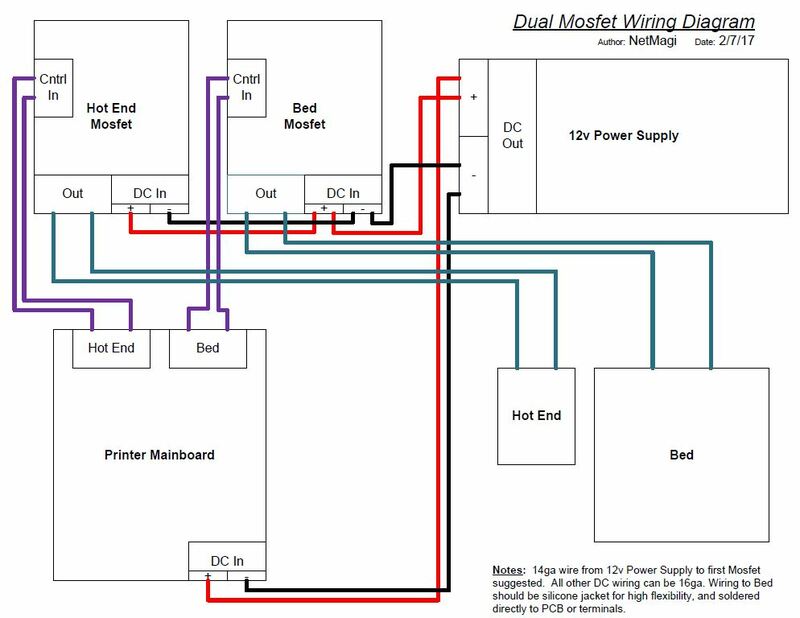 Been doing alot of research and the dual mosfet and dual power supply seem to be one of the most highly recommended upgrades to do early in the printers life cycle and I can’t find or design a better mosfet mount then the one you provided! So yea, thanks again for a simple diagram and perfect mount! Nice writeup. I noticed you wired the the mosfets in a serial way. (I’m not an electrician, but i think that is what you call it). Could you also wire them each individually connected to the power supply? They are not wired in a series on my diagram. They are wired in Parallel. Please see the below page for more info about the two types of circuits. Your MOSFET’s should be wired in parallel. Nice write up, and I have done this with my printer (also swapped out the bed as I had an issue with the original bed being wrapped, the new one is a 200W at 12 volts pad + plate vs the PCB style), but I ran into an issue. I have the Control In hooked up, I have cable from the power supply going to the In on the MOSFET and the bed hooked up on the other in. As soon as I plug the printer in, the bed starts heating up and the MOSFET gets crazy hot, even the board gets hot. I haven’t even told the bed to turn on at this point and it is already trying to heat it up. I only get the D2 red light on the board. Do I have a bad board or am I missing something? I have changed the firmware for Skynet, so I am not sure if that might be the issue or not. It sounds like you might have the MOSFET connected wrong. It should barely get warm while running the bed. Have another look at my wiring diagram, and trace each wire to confirm it’s hooked up right. 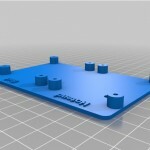 Hi Rich, I stumbled upon your article after doing a little research on my new 3D printer (Anet A8). I am keen to drop in some MOSFET modules and off-load the heavy current from the main controller. I am having difficulty finding any units on Amazon that will ship to Australia. I am also having a hard time finding suitable units (>10Amp) on ebay, etc. I have seen hundreds of MOSFET DC motor driver boards. These are a ‘H-Bridge’ setup, but I am wondering if I can use one of those boards to drive the 2 devices (Bed & Head) ? That board is designed for PWM. That’s not to say it wouldn’t hold up under constant duty, but I’d keep searching for one of the std. mosfet boards. Question. The thermister wires. Do they still go to the motherboard or just the contol wires from the mosfets? They are unchanged, they still goto the mobo. Hey thanks for the write up! Quick question, I am new to wiring electronics and was wondering about how to do the two wires in a single terminal. I was planning on using a spade crimp but I do not think I can fit both wilres to fit in one. Did you just twist the wires together, solder the end and put it in the terminal? I tin them, and put one to the right side of the screw, and one to the left. As long as the wire gauges match, or are very close, it’s usually good. There’s debate on whether wires should be tinned before going under a mechanical fastener, since the solder will cold flow a bit, but I’ve found if I tighten them, then re-tighten after a few days of use they stay tight and make good conduct. Hi. Thanks for the article. I just want to ask, why is the mosfet board using 6 connections (2 for power, 2 for output and 2 for input). Why don’t they use the same ground pin? Also do you have any info on how they connect the mosfet to those pins? I am planning to go buy the mosfet and do it myself. Thanks a ton for the write-up, the links to the parts, and the time and effort to help us newbs. It’s folks like you that keep my faith in the internet alive. I do have one quick question: I ordered the mosfets that you linked to and they came with crazy short input wires. I had to flip my mobo upside down to make them reach. My concern is that the wires are also crazy skinny. Are you sure it’s kosher to plug those into the bed and extruder’s original power connectors? I’m undergoing this repair job because I’ve already melted a sub-par connection, I’d hate to create one more. Yeh, they all come with really short leads or worse, no leads at all. I extended mine to install the mosfets where I did with some wire I had left over from a garage door opener installation (the 2-conductor solid stuff around 22 or 24 AWG). The thin wires are fine, as they only drive the control side of the circuit now, switching the mosfets on and off. Thank you for this post, I just got an A8 (as it looks like fun learning about 3D printing) and everyone is telling me to get a mosfet …. but since I have kids, I’m getting two just for the extra safety (both hotbbed and extruder). So while I’m waiting for the mosfets to come here, I’ve got a couple of questions. From what I understand, the amperage going through that part of the circuit is minimal and those wires should be ok…. is this correct ? 2) Looking at the schematics, it looks like both mosfets are in parallel; but in your thingiverse setup pictures it looks both mosfets are connected directly to the PSU. The difference seen in the schematics is made to save some wiring, but both setups are equivalent to my (old) understanding, right ? In the schematics shown in the blog here, the connectors (the pair coming from the PSU and the pair going to the second mosfet) will be using the same mosfet “DC in” … is there enough space for this or is it too cramped and may risk of causing a short ? Mine is wired to match the schematic. I use a single run from the PS and essentially just use the first DC-in on the MOSFET to split the power at that point. As long as you use 14 gauge wire, this is fine. The ctrl wires carry very little current, and anything 22 gauge or better is sufficient. 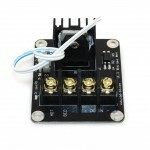 Does your Mosfet holder require holes drilled in the Anet A8 frame or use existing holes? Thanks for posing about this. So the control wire to the mosfet hooks to the bed power coming out of the motherboard. Hey, in your article, you talk about replacing the wires between the main-board and the heater-block (extruder).. How do I go about doing that? The stock Anet 8A comes with these wires wrapped, tapped, and leading to inside the heater-block..
I’m referring to the wires to the heated bed. i have not had any issues with the stock wire for the hot end. You are welcome, and good luck with the build! This PS cost $30 earlier this year and $20 when I bought one yesterday (Black Friday). I had to bring all the 12V lines together to run to the motherboard and cut and tie off the lines I didn’t need. What’s cool about using a PC PS is that there is a 5V line that is always alive that I use to power the Rpi that’s running my Repetier server and there is a line I ran to a switch to turn the PS on. I use Delphi Weatherpack connectors (http://www.jegs.com/i/JEGS/555/10750/10002/-1?CAWELAID=1710730288&CAGPSPN=pla&CAAGID=39714413703&CATCI=pla-293995373017&CATARGETID=230006180039220954&cadevice=m&gclid=CjwKCAiAxuTQBRBmEiwAAkFF1sDlA88RSzfdv2Afl0kO2UwOo8YKKf8cZK6Xk9gBsdVpbCYpma9EHRoCH9EQAvD_BwE) . I like the fact that these connectors are rated to handle 20A (although I like keeping it closer to 10A) and are waterproof. It’s a little spendy to start since you have to buy a $30 crimper but these things have been bullet-proof and are a snap to install after I found instructions on only stripping 1/4″ and crimping the right parts. I’m glad to hear you had success with your replacement, but I would strongly recommend against using a computer (AT/ATX) power supply. They are designed to have current drawn on their different outputs simultaneously and tend to suffer significant voltage drops if only one output is drawn at a high current. You can get around this by adding some large power resistors to the unused (or lesser-used outputs), but it generates a bunch of heat and generally isn’t worth the effort. That Pi is probably only drawing half an amp on the 5v output, which means the 12v output on the power supply is likely sagging down under 12v when the bed and hotend are pulling current. Measure the 12v output while the printer is warming up. Thank you for the write up, Just got my mosfets in today. Word of warning, mine came with no heatsink compound between the mosfet and heatsink. I also found that the heatsink on the inside rear side of the power supply also is lacking the heatsink compound. This compound aids in heat transfer and without it the components like mosfets and diodes can overheat. BTW my A8 is from Feb 2018. To add compound you have to remove the three screws on the rear side (one is under the label). I know this will void the warranty but better safe than sorry. Is there any polarity for the control (trigger) wire. No, there is no polarity for the control wire. In the wiring diagram you have two wires coming from the power supply (one to the main board and the other to the two MOSFET. 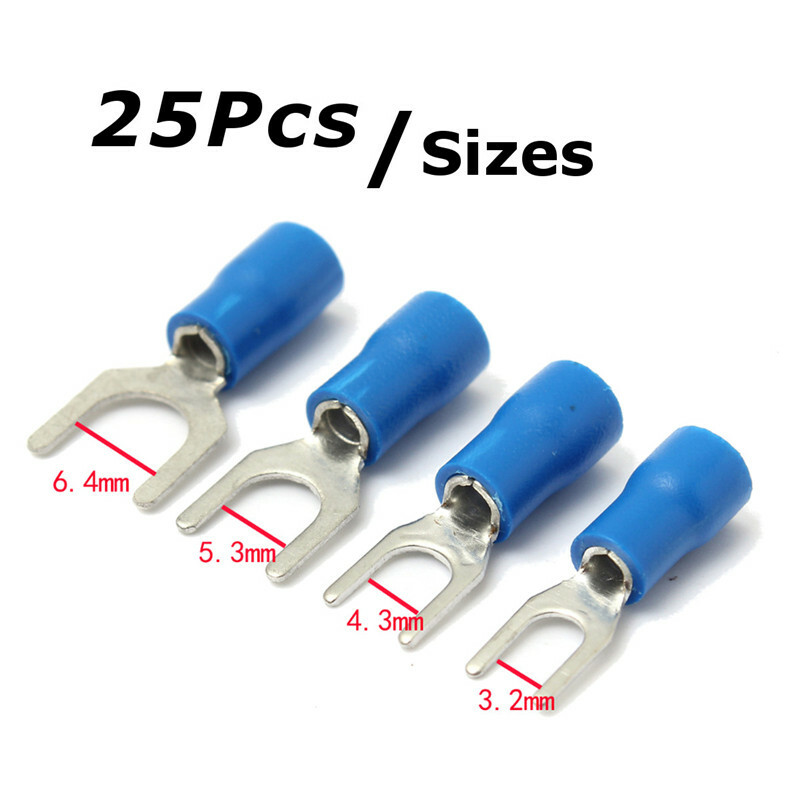 Would mine be alright if I wired them as such: PSU -> MOSEFT1 -> jam two wires into the MOSTFET1 power input to connect MOSFET2 -> jam two wires into the MOSEFT2 power input to connect the main board? If I remember correctly this should still be a parallel circuit. Would the wires still be able to handle the current? I would recommend following the wiring diagram, or you should adjust the wire gauge size accordingly to accommodate the additional load. 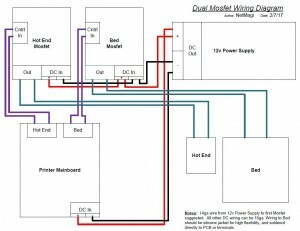 Good wiring scheme for Power, but there is something missing, where I connect the sensor cables coming from the BED and the EXTRUSER? They remain connected to the main board. No change for those wires.